The International Confederation of Midwives, together with Laerdal Global Health, implemented the 10,000 Happy Birthdays project from 2014-2016. Using the Helping Mothers Survive: Bleeding after Birth (HMS-BAB) and Helping Babies Survive: Helping Babies Breathe (HBS-HBB) modules, the midwifery associations in Malawi and Zambia trained maternal and newborn care providers in almost all districts and nursing schools in the two countries. These are just a few examples of how providers have used the skills they learned to save the lives of mothers and babies on the day of birth. Ester gave birth to her first child at Chikwa Health Center in Zambia. After delivering, she continued to bleed heavily. With the nearest hospital 6 hours away, Ester’s life was in the hands of her midwife, Musama (the man in the photo). Ester worried for her life, and about the future of her baby. Luckily, Musama had been trained with the Helping Mothers Survive program and knew what to do. He managed to con trol the bleeding and stabilize Ester. She survived and was very thankful to have a professional midwife by her side. Shortly after Caroline Makoko gave birth to her son, she experienced profuse bleeding which threatened her life. 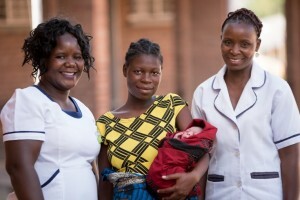 Her midwives at the Chilomoni Health Center in Malawi had been trained in the Helping Mothers Survive program –as part of the 10,000 Happy Birthdays program. She knew what to do to save her life. Thanks to midwives Regina Kanyerere and Naomi Guba, Caroline survived and one less baby lost a mother. Stories captured by Laerdal Global Health www.laerdalgloblahealth.com. For more information, contact camila.barrera.daza@laerdal.com.